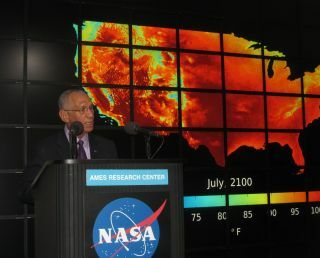 NASA Administrator Charles Bolden discusses the Third U.S. National Climate Assessment at the space agency's Ames Research Center in California on May 8, 2014. MOUNTAIN VIEW, Calif. — Humanity must act now if it hopes to stave off the worst impacts of climate change, NASA chief Charles Bolden says. Climate change is not some far-off, nebulous issue that future generations will have to confront, Bolden told reporters Thursday (May 8) during a discussion of the Third U.S. National Climate Assessment report here at NASA's Ames Research Center. Rather, it's happening right now, and people all over the world are already feeling the effects. The latest National Climate Assessment (NCA), which was released by the White House on Tuesday (May 6), is the most comprehensive and authoritative document ever written about how climate change is affecting the United States, Bolden added. The report doesn't paint a pretty picture. "Precipitation patterns are changing, sea level is rising, the oceans are becoming more acidic and the frequency and intensity of some extreme weather events are increasing," the NCA states. "The observed warming and other climatic changes are triggering wide-ranging impacts in every region of our country and throughout our economy." Bolden spoke in front of Ames' "hyperwall," a 23-foot-wide (7 meters) visualization system that helps scientists analyze and display huge and complicated datasets. Over Bolden's right shoulder, the hyperwall showed a map of the continental United States depicting average July temperatures in 1950. Over his left shoulder was a prediction of how this map would look in July 2100 in a "business as usual" scenario, with no meaningful action taken to curb emissions of the heat-trapping gas carbon dioxide. On the 1950 map, only a small corner of the southwestern U.S. blushes dark red, indicating average July temperatures of at least 105 degrees Fahrenheit (41 degrees Celsius). But this color covers about one-third of the 2100 map — including some of today's prime agricultural land in the Midwest and Great Plains. "We don't want to be there," Bolden said, gesturing toward the July 2100 map. "We think we can do something about it." Taking steps to reduce the use of fossil fuels such as coal and petroleum would indeed make a difference, helping the nation and the world mitigate some of climate change's most dramatic effects, the NCA states. But impacts are unavoidable (and ongoing) at this point, because carbon dioxide stays in Earth's atmosphere for decades. "The amount of warming projected beyond the next few decades is directly linked to the cumulative global emissions of heat-trapping gases and particles," the NCA report states. "By the end of this century, a roughly 3-degree F to 5-degree F rise is projected under a lower emissions scenario, which would require substantial reductions in emissions (referred to as the 'B1 scenario'), and a 5-degree F to 10-degree F rise for a higher emissions scenario assuming continued increases in emissions, predominantly from fossil fuel combustion (referred to as the 'A2 scenario')." NASA scientists and satellites contributed greatly to the NCA report, Bolden said, and the space agency will continue to keep tabs on the planet from above. NASA has already launched one Earth-observation mission in 2014 — the Global Precipitation Measurement core observatory, which blasted off in February — and will loft four more before the calendar flips over. "I am calling this — in fact, NASA now calls it — the year of Earth," Bolden said. "We're focusing on trying to put instruments up, whether they're on the International Space Station or free flyers, that will help us get more information to help us understand more about what's happening on our Earth."